DJ Hero, a game that's not seen downloadable content since November, gets a much-needed shot of new content next week, with a trio of mash-ups featuring Eminem and JAY-Z. The JAY-Z vs. Eminem Mix Pack is only the third dose of downloadable content that's come to DJ Hero since its release in October of 2009, with one pack showing up on the day the game was released and another dropping a month later. 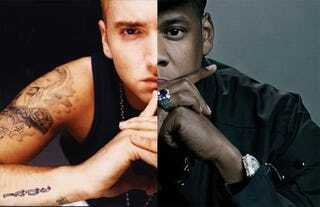 This new pack, dropping March 18 for the Xbox and March 25 for the Wii and PlayStation 3, melds together the music of rappers JAY-Z and Eminem across three new tracks. Like the previously released packs, this one will only be available as a full set on the 360 and PS3, setting buyers back 640 Microsoft points or $7.99. Wii users will be able to purchase the tracks individually. Not a bad selection of tunes, but I packed away my DJ Hero turntable months ago and have no intention of digging it out now.